The next City Fans United meeting will take place in the Blues Bar, at the Swansway Chester Stadium, on Thursday 15th November. The meeting that will get underway at 7.30pm, is an informal meeting and so is open to non-members as well as current members. 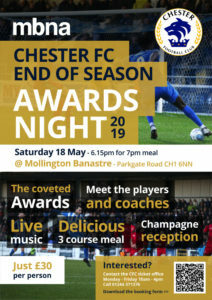 It’s an ideal opportunity to come and hear from the CFU board on latest developments, as well as hopefully hearing from joint managers Bern & Jonno. You can also sign up to CFU membership on the night too, with the membership package an unbeatable £12 per year at present. The intention is also to stream the meeting on our CFU You Tube channel, on the evening itself. 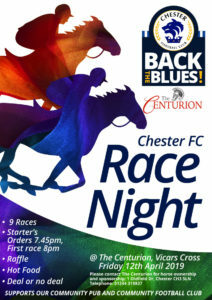 The City Fans United Annual General Meeting took place last Thursday at the Swansway Chester Stadium, inside a packed Blues Bar. On the night, Calvin Hughes and Jeff Banks, both of whom stood for election to the board saw their applications ratified by the members who had voted either by proxy or on the night itself. Both will now commence a minimum three year term on the board of directors of CFU. Laurence Kirby, who stood down as a director of the board on the night, presented his financial report to the audience both in the room and watching online. Laurence confirmed that CFU had made a £45k loss in the financial year June 2017-May 2018 but that prospects of a brighter future were indeed in place following some fantastic fundraising by volunteers since January 2018. Laurence also indicated that he would be prepared to maintain his financial reporting to the board in the interim whilst a permanent replacement is sought in due course, which the board have wholeheartedly thanked Laurence for. The Chair of CFU, David Harrington-Wright, also gave a detailed report on the year itself too, and fielded questions from the audience relating to the club’s current financial position, and also with regards to the water damage to the Stadium too, even though this was experienced after the previous financial year had ended. Minutes of the meeting will be published shortly on the CFU website. Thanks to everyone that attended on the night, and we look forward to keeping the membership updated with the progress made as we go through the next financial period, June 2018-May 2019.